Now that it is officially 2011, it's time for me to present my annual doodley thing for the year. I must admit, it was notably harder this year because of the two "ones." I noted a year ago that we typically spend 31 December overly romanticizing the coming year, while we spend 1 January getting used to the fact that the first day of the new year is, in fact, exactly like what we'd already been used to. For 2010, it took, at most, a few hours for me to get acclimated to that. Just a flaw of human nature, I guess. It's still the holiday break, and my brother is still home. Today started, unfortunately enough, with some of the same gripes that many a day in 2010 did. I didn't do much different today from what I did yesterday. Mostly watching football, blogging, and doing year-end website stats. I'm still closing out my post-graduation list of things I'd put off doing. Still, it's important to look forward. While I'd always known that 2010 was at least going to bring the end of my undergraduate career, 2011 is effectively a blank slate. There is absolutely nothing on my life calendar which is more-or-less guaranteed to fall in 2011, and there hasn't been. Whereas at the dawn of previous years, there was always something somewhere on the horizon, I simply don't have that this year. In some ways, that's refreshingly inspiring. In others, it's paralyzingly daunting. But I'm looking forward to it. 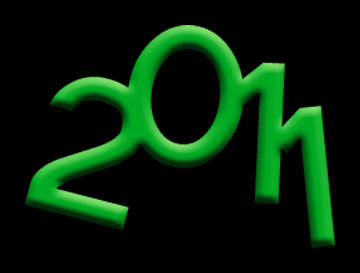 Who knows what 2011 will bring? It's exciting, in a way. I have some ideas of how I want to shape this year (in ways both big and small), but who knows where exactly I'll end up?